Star of Bethlehem - Scholars debate whether the Star of Bethlehem is a legend created by the early church or a miracle that marked the advent of Christ. Could it be that the star was the result of an document-able cosmic event? Presenter Rick Larson walks you through Biblical, historical and scientific clues revealing the incredible significance of this celestial event as well as the vastness of God's creativity. This breath-taking documentary has been seen by thousands. It features in depth scientific scholarship and attention to detail as it reveals a compelling explanation for the Star. Prepare to be blown away by the fascinating evidence! Produced by Stephen McVeety, The Passion of the Christ. Widescreen. 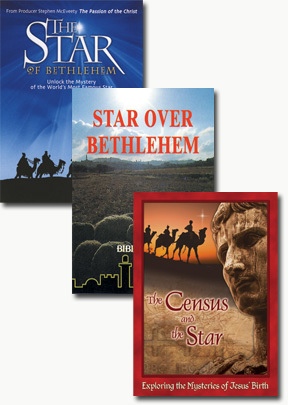 ?The Census and the Star - Explore the mysterious circumstances of Christ’s birth in this captivating look at the first Christmas. Joseph and Mary traveled to Bethlehem by order of the Emperor, Augustus Caesar. This census has long confounded historians seeking to reconcile the Bible with recorded history. The evidence to address that is both intriguing and insightful. The mysteries continue when a star appears to announce the birth of the King of the Jews. What was the star? What did it look like? When did it appear? Foreign Magi, or Wise Men, saw the star and followed it to Jerusalem and Bethlehem seeking Jesus. These little-understood figures were among the first to discover Jesus in what was surely a life-changing, as well as history-making, event. Explore the star as the Magi did, following it to better understand Christmas. Trace what the Magi did as they gazed into the night sky those thousands of years ago. Find answers to these questions and more... What really happened on the first Christmas? Star Over Bethlehem - Experience the wonders of Christmas more fully. From the Annunciation in Nazareth to the Nativity in Bethlehem, the story is full of insight and joy. The film includes ancient traditions, biblical sites and ancient chants. Filmed on the actual locations in the Holy Land, this is the complete Christmas story.